The Cleveland Browns ended our long national nightmare on Thursday, naming Mike Pettine as the team’s head coach. 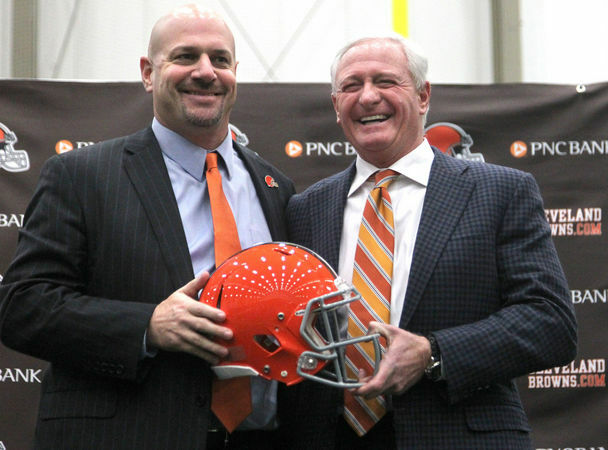 It is the first head coaching job on the NFL level for Pettine, a longtime defensive coach, but the second head coach hiring in as many years for Browns owner Jimmy Haslam. Pettine hit all the right notes in his introductory news conference, but there is no way of knowing, yet, if he is the coach who will finally get things turned around for the Browns. After all, the Browns have now hired nine head coaches under three different ownership groups since firing Marty Schottenheimer following the 1988 season and every one of them was supposed to be “the guy.” And, for a variety of reasons, every single one of them failed. So why will Pettine be different? For starters, he is not a retread, his last name is not Gruden, and he has no known connections to Bill Belichick. There is a lot to like about him, starting with his body of work. In his one year as defensive coordinator in Buffalo, the Bills defense improved from 22nd to 10th in yards allowed, were tops in the league in opponent’s completion percentage, second in interceptions and third in opponent’s quarterback rating. In New York with the Jets, his defense led the NFL in points per game, total yards per game and passing yards per game in 2009, and made consecutive AFC Championship Games. And while he was not the head man with the Jets, the fact that he could survive in New York means he’ll have no problem with the milquetoast Cleveland media. We liked that when Horton promised it; we’ll like it even better if Pettine can deliver it. Just as important as the numbers is that Pettine brings something to Cleveland that we haven’t seen in a Browns coach in a long, long time: respect. Coaches that have worked with Pettine, and players that have played for him, can’t seem to say enough good things about Pettine. That fact the Buffalo didn’t want him to leave has to mean something, as that clearly hasn’t been the case with the past three coaching hires the Browns have made. There are still a lot of questions that need answered on Pettine, mainly who will his coordinators be? And we won’t know what he’s like on game days until things get real in September. Time will tell if the Browns made the right choice in hiring Pettine, but he provides what we always need in Cleveland – hope that a better day is coming.